A recently released NASA picture shows a space explosion looks impressive even more than a century after it occurred. The newly released image, resembling fireworks in the night sky, actually features GK Persei, a nova produced by an explosion of a white dwarf star, NASA said on its website. The dwarf exploded in 1901, causing an astronomical sensation back then. For a few days it was one of the brightest stars, but quickly faded away. A century later, in 2000, NASA scientists studied the nova with the help of Chandra X-ray Observatory. They returned back to it again in 2013. One result of their work is the image of the orb around the exploded dwarf, which is actually three pictures in one. 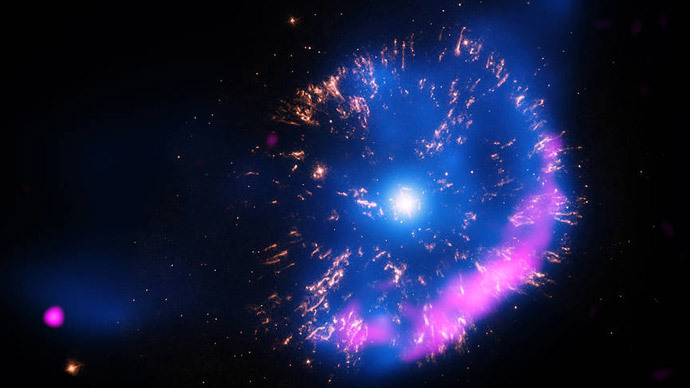 The blue in the “firework” is X-rays from Chandra, the yellow is optical data from NASA’s Hubble Space Telescope, and the pink is radio data from the National Science Foundation’s Very Large Array. The scientists have also been able to trace the changes with the nova over the 13 years in between their two observations. “Over the years that the Chandra data spans, the nova debris expanded at a speed of about 700,000 miles per hour. This translates to the blast wave moving about 90 billion miles during that period,” the findings cited by NASA said, while the full report on the fading of the nova has been published in the Astrophysical Journal on March 10. The scientists have also been thrilled to discover that while the X-ray luminosity of the nova greatly decreased by about 40 percent, the temperature of the gas in it has remained almost the same - around one million degrees Celsius. NASA describes the findings as “intriguing” and helping better understand the environment of a star explosion.